His project, Ella Pad, started as a proposal for his Sustainable Consumption and Production e-course. 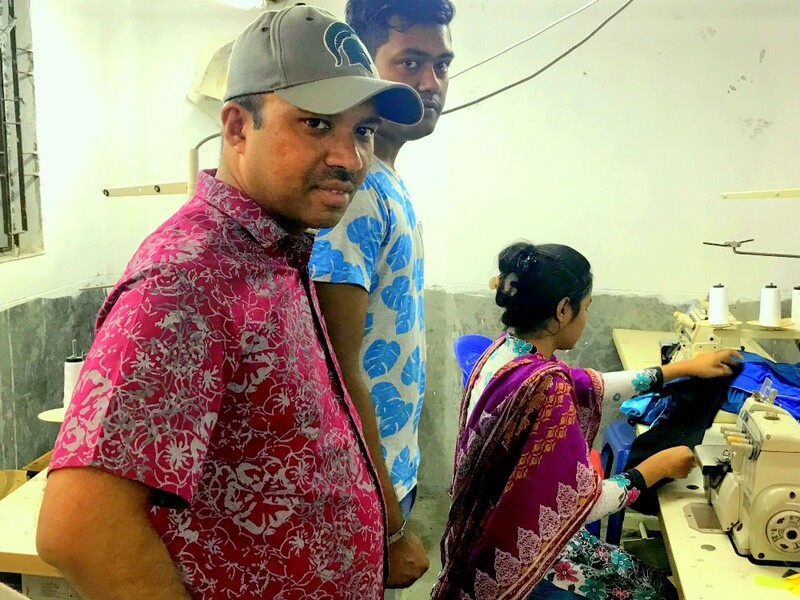 Now, his plan to make sanitary napkins from garment scraps has moved beyond UNITAR’s online classrooms to MIT D-Lab and actual Bangladeshi garment factories. This is Ella Pad’s story. A seventeen-year-old girl fainted and fell down on her friend’s lap. She died on the way to hospital, where they found two poisonous snake worms in her uterus. This is not an isolated case. Other women, working in factories, face this and other, more challenging issues. Among these, access to feminine hygiene products. Women in Bangladesh lack access to sanitary napkins and usually depend on dirty rags secretly kept inside dark outhouses. Menstrual hygiene management is a taboo topic — we can hardly talk about it in public spaces. According to a factory physician “women workers are facing lot of reproductive health related infectious diseases having no or less access to sanitation facilities.” Why? Because “many factories impose restriction of using toilet,” claims a female trade union leader. Sanitary pads are luxurious items for common women, let alone poor garment factory workers. Women in factories are suffering from many infectious sexual and reproductive health-related infectious diseases. In 2013, with the support of the United Nations Population Fund (UNFPA), Mamunur Rahman, a participant of the e-course on Sustainable and Consumption and Production and Introduction to a Green Economy: Concepts and Applications organized by UNITAR, conducted a survey of 15 factories in Dhaka and found that women workers are absent three to four days on average each month because they lack access to sanitary napkins. These are days they could be working and earning their wages. The garment sector in Bangladesh has about four million women workers and dominates world markets. Working conditions inside the factories and workers’ well-being is a critical issue for the growth of this sector. In the Rana Plaza tragedy of April 2013, leading global fashion brands sourcing from Bangladesh struggled when the collapse of a large factory left 1,134 workers dead. Despite this and other incidents, the clothing sector is growing fast. Each year, it contributes $28 billion to the economy — a contribution that will near $50 billion as Bangladesh continues to be a haven for global clothing brands (McKinsey 2017). 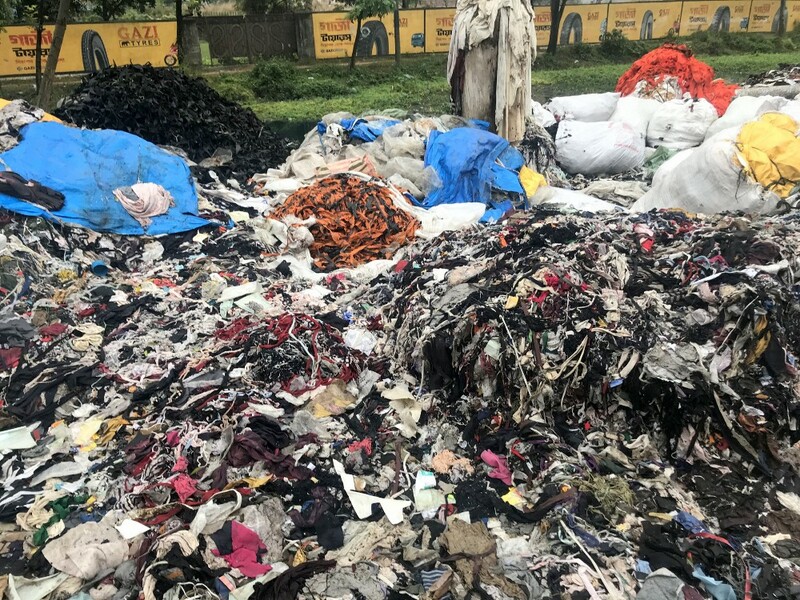 At the same time, the sector is currently releasing about 1 million bales of solid garment waste every year, which could be turned into asset of $4 billion (USDA 2017). Bangladeshi cities can hardly manage the garment waste piled high on roadsides. Often these scraps are burned, polluting and creating environmental hazards in cities. Ella Pad’s model demonstrates a possible solution: a low-cost sanitary napkin made of garment waste. 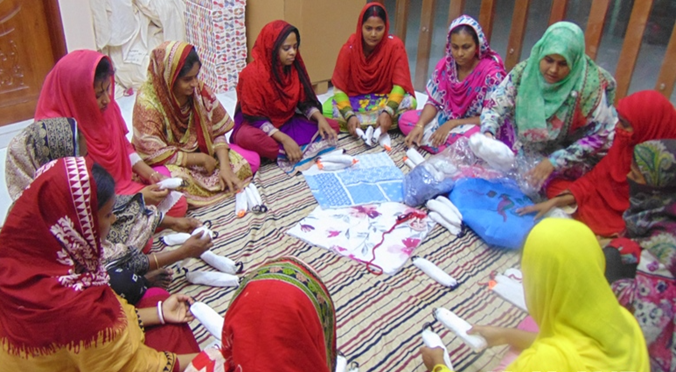 Low-cost sanitary napkins can drastically change the lives of women working in factories. “Now, I feel good to go to my work regularly,” said Rahima, a young worker of garment factory at Savar, a neighborhood in Dhaka city, “I’m grateful to Ella Pad, which made our life easy.” Before, she and woman like her would have had to take sick leave; at the factory, sick leave is unpaid. Prior to having access to an Ella Pad, Rahima would only take home a salary for 27/28 days of the month. Thanks to Ella Pad, Rahima can now enjoy her full month salary — all 30/31 days of it. Ella Pad is enhancing the well-being and productivity of workers and playing a catalytic role in achieving at least 11 out of the 17 sustainable development goals (SDGs). Using garment waste for sanitary napkins is key to our model’s sustainability. The model has two components: production and distribution. Both components are managed by poor, working women. The key feature of the product is that it’s made by female workers, owned by female workers, and used by female workers. This successful pilot study in a small factory of 500 workers gave Mamunur the confidence to move further. In the next phase, a group of entrepreneurial minded and enthusiastic workers (five to ten depending on size of the firm) have been selected through an open competition in medium and large factories. Meanwhile, MIT D-Lab had guided Mamunur and his team in developing and diversifying the products. Where before Ella Pad made only sanitary napkins, now the team is making women’s underwear and reusable sanitary pads as well. Looking to the future, the target is to have at least 1,000 female entrepreneur groups in factories by 2020. The hope is to create at least 10,000 green jobs producing Ella feminine hygiene products. Mamunur’s ultimate vision is to create a global revolution with his innovative initiative where ‘workers are becoming entrepreneurs’. Changing the conventional economic system where workers are considered as mere wage earners, Ella Pad is recognizing workers’ creative and entrepreneurial traits. On 4 January 2018, US Embassy Dhaka organized an event on Ella Pad. 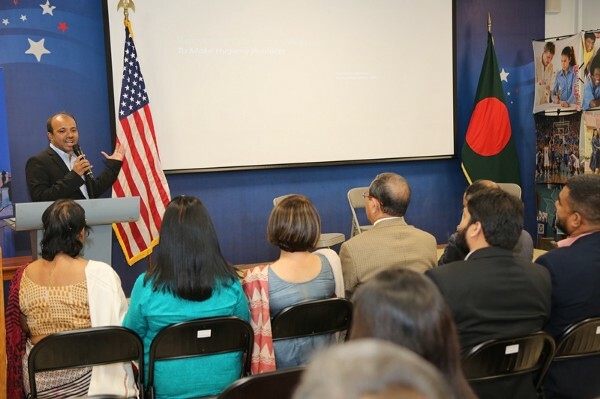 The event was circulated through social media of both US Embassy and USAID Bangladesh in Dhaka. Ella Staffs and volunteers also had a meeting with Nobel Peace Laureate Dr. Muhmammd Yunus recently. 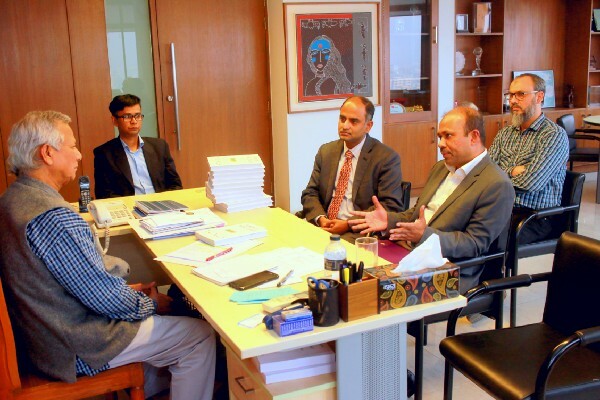 Dr. Yunus showed his interest in Ella Pad project and wished their best of luck to the project. 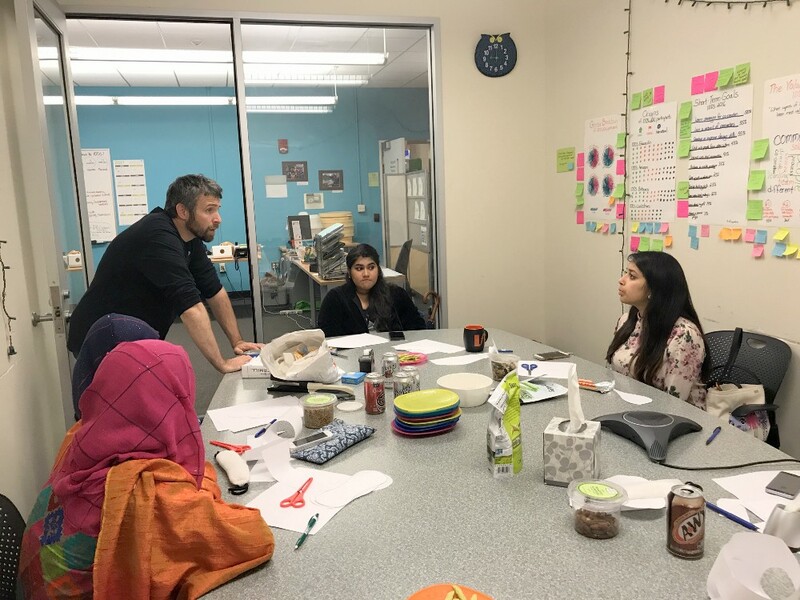 From UNITAR’s online classrooms to Bangladeshi women, Mamunur Rahman and Ella Pad have been dedicated to sustainable solutions. Made for women, by women, and lead by women, Ella Pad is a clear example of not only creative problem solving, but sustainable problem solving. 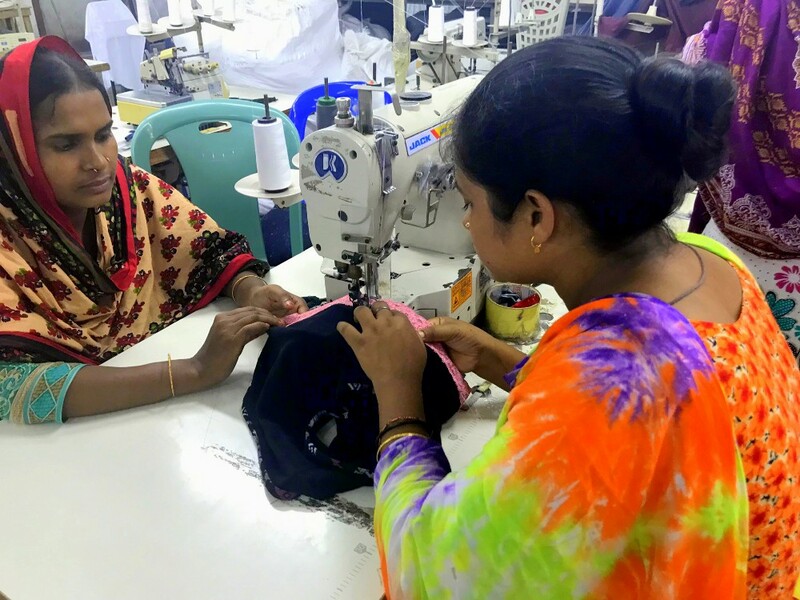 Where before, clothing scraps lined Bangladeshi streets and hard-working women lacked access to vital healthcare products, now those scraps are creating meaningful, sustainable change for female entrepreneurs and the factories around them.